Our production is based on two manufacturing sites, the historic one in Casalecchio di Reno, the headquarter of management offices and where all the aluminum machining is carried out, as well as the assembly, final test and shipment of pumps and motors for our core business: the industrial and mobile markets. In our Zola Predosa plant, the former Marzocchi SPA (suspension for motorcycles and mountain bikes), today so-called NEPLA all machining operation of gears are carried out. NEPLA is also dedicated to the assemblying and testing of the pumps for Automotive applications whose big growth in these last years led to the necessity of a new and dedicated plant. In NEPLA there are three semi-automatic lines and a high-automation line. In the main factory of Casalecchio work 177 employees on a 6.620 sqm surface. In NEPLA, about 30 employees work on an area of 8.600 square meters. Montirone is a Joint Venture that Marzocchi Pompe developed to be able to directly access the supply of high-quality die cast components. 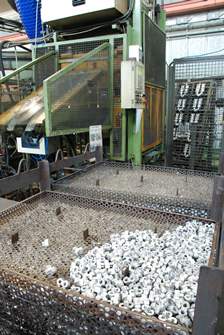 The Company owns 250 to 500 tonne presses selling their products mainly to the Automotive and Fluid Power Customers. Montirone is located in San Giovanni in Persiceto, about 20 km away from Marzocchi Pompe.